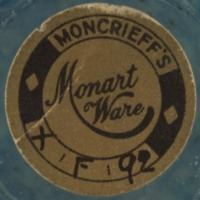 Numbering added to Monart labels to enable accurate referencing. 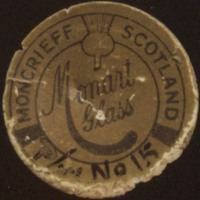 Also added cross referencing to Ysart Glass book plates. 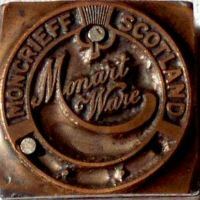 This is a reversed image of a Moncrieff printing block for Monart labels. 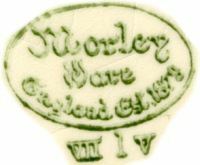 Very similar to W3 but no examples of a label from this block have been seen. 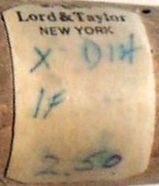 Retailer label reported on a vase. 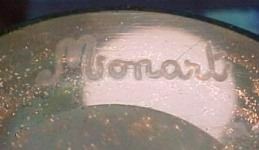 Monart Signature – What is the FBS or BFS mark? 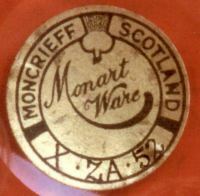 The FBS mark is only found on ‘export’ marked Monart. 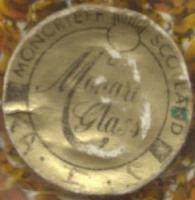 It has also been reported on one French piece of glass and on the paper label of an Italian piece of glass. 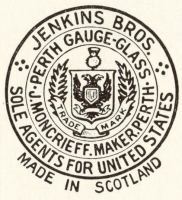 This would suggest that FBS is probably an American glass retailer. 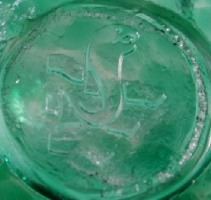 It would be nice to identify the name to go with the initials. 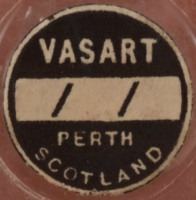 Real or a fakers work piece, styled like Vasart sigs? Not as neat as above! 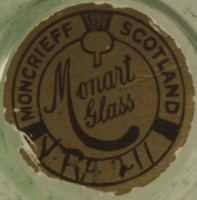 This example probably came from the Monart storeroom when Moncrieff’s closed. 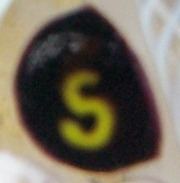 The san-serif signature is rarely found. 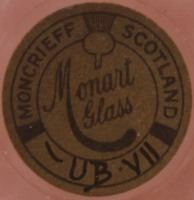 These labels were used on packaging and cut lengths of glass without Moncrieff sandblast marking; they were reproduced in the 1933 catalogue of the US distributor. 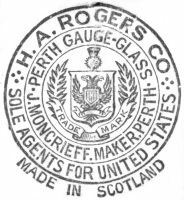 Same design but for H A Rogers Co (USA). 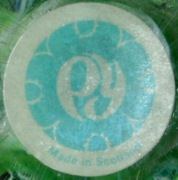 So far I can find no information on this company. 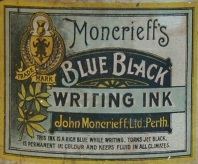 Text "This ink is a rich blue while writing, turns jet black, is permanent in colour and keeps fluid in all climates." 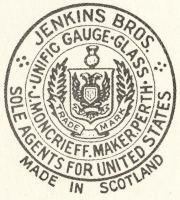 From 'Master Ink' bottle. 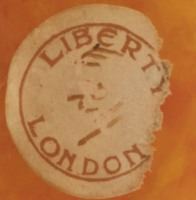 This mark is printed/etched? 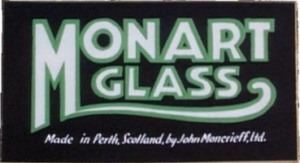 onto laboratory glassware. 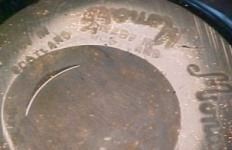 Accoring to Godden this mark was for August 1944 which implies the Pirelli label was the earliest in use. 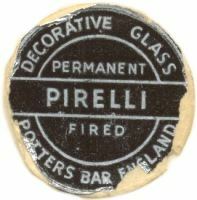 Pirelli label found on Vasart ware and weights. 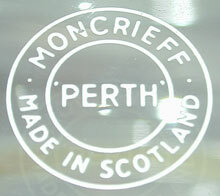 Note “Hand Made in Scotland”. PY2017 ? 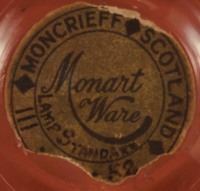 Was this a Moncrieff weight? Squashed in PY2003. Weight signed. 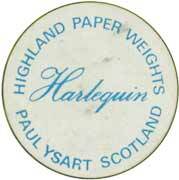 Used in Paul's Harland studio. Found on PY2028. 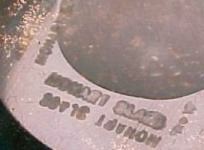 Signatures were added for visitors, not to ID weights.